You can see the whole toolkit here and example of the Reuters reporters work can be found at Reuters Mobile Journalism. As anyone who has been watching my videos over the last few days knows, I can, actually anyone can, make these amateur videos. However, for me, every time I make one, I keep thinking I have to learn to do this better. At ConvergeSouth 2007 Brandon Gross and Saskia Wilson-Brown from CurrentTv, were carrying a little $100 Flip Video camera with an hour’s worth of low quality video capabilities. I said I was ready to trade up, and they were saying no, these hand-helds are the future, people are accustom to watching them. Maybe, but for me I have gone through that stage. I want to shoot better videos. However, whether I, and the other amateur videographers, want to go through the learning curve is another question that is yet to be answered. Thanks to Josh Catone at Read/Write Web and Sam Harrelson for the pointers. This entry was posted on Friday, October 26th, 2007 at 5:45 pm	and is filed under Brandon Gross, Citizen journalism, Current.com, Current.tv, Journalism, Media, Mobile Journalism, Newspapers, Nokia, Reinventing Journalism, Reuters, Uncategorized, Vlogs, digital media, mojo. You can follow any responses to this entry through the RSS 2.0 feed. Both comments and pings are currently closed. mega pixel camera for still and video is hell of a good. There are many software those can increase the Video capturing on NoKia N95. I haven’t come across any software like that but my quest is on.. hopeful it will not be never-ending. 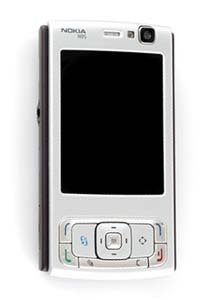 But One can enrich one’s Nokia N95 with latest software and games. During my quest, i encountered many good softwares for my one. Try out feedurmobile.com and nclubsoft.com for your mobile phone. What makes this a “Journalism Experiment” rather than an elaborate promotional stunt for the Nokia N95? The word “experiment” indicates the testing of a hypothesis under controlled circumstances. Much is made of the “kit” which is being recommended by the project. Such a kit can be assembled from many different brands of components and were I hammering together such a recommendation would certainly have “low budget,” “medium budget” and “top-of-the-line” versions, if not under precisely those titles. Were I to focus on just one device from one manufacturer, I would feel I was advertising, not conducting an experiment or assembling a general purpose kit. Is the Nkoia/Reuters “experiment” not advertising/promotional rather than an experiment? I am asking, albeit with a chip on my shoulder, but asking nonetheless. Good question to ask Reuters.